First off, what a week! President: Hi Sisters, President Anderson here. Us: Hi President, How are you? President: Good, good. Hey, I was talking to Sister Burt yesterday and I hear your apartment is gross. I want you sisters to get out of there are soon as possible, okay? At least by when your lease ends. Us: Alright President, we will do that for sure! Thank you! Yep! We were SOOOO excited! Our apartment is the ghetto. Seriously. We lifted up some of our carpet the other day and found a bit of mold and dead bugs UNDER our carpet. It was unnerving to say the least. The only hiccup with this whole thing is that our lease is up on Thursday! So now we are down to 3 days to find a place. Wooooo.....So a huge chunk of last week was spent apartment hunting. It was a bit frustrating because we live on the West side of Casper, and our apartment is on the West side of Casper, but 95% of apartments are on the East side. So trying to find something on the West side has been difficult. But we will be victorious! We are both SO excited to leave. :) haha. Missionary life never ceases to be an adventure! 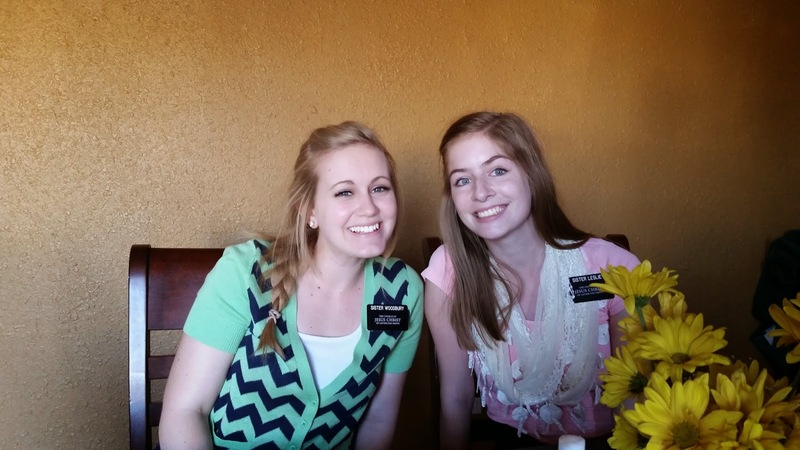 So a little information on Sister Woodbury: first off, she is AWESOME! and beautiful and funny and just downright great. She is from Mesa, AZ and has been out for 6 months. She just came from Sturgis, SD and is seriously such a good missionary! She is like exactly 1 month younger than me, did a semester at BYU-Provo before coming out.....yep! Next transfer is going to be the best because it will be my birthday, my year mark (THAT is the VERY BAD PART), and her birthday. It's going to be great! SO yeah. We get along great and I am so excited that I have her as my companion! I have really learned this week the importance of the commandments, especially the Word of Wisdom. The Word of Wisdom is God's law of health given to us, and it tells us to abstain from coffee, tea, alcohol, tobacco and other harmful or addictive substances. But I have learned that more importantly than that, the Word of Wisdom is a law of obedience. People can fight all day long that tea is healthy for you or whatever, but the bottom line is that the Word of Wisdom is a law of obedience given to see how well we will obey the commandment from God, even if we don't fully understand why. That has been really powerful to me this week. Faith is the foundation of the gospel, and it is by faith that we can keep the commandments, even if we don't understand why it was given. Something else that stood out to me this week was the fact that every priesthood holder in The Church of Jesus Christ of Latter-Day Saints can trace their priesthood authority directly back to Jesus Christ Himself. This is not "Mormon Priesthood" or Man's Priesthood, it is God's Priesthood--God's power on the earth given to man so that man can help all of God's children return to Him. I know that to be true. This isn't just another church, this is the exact Church that Christ established onto the earth! I know it, I know that God knows it, and I cannot deny it. I love being a missionary, I wouldn't exchange it for anything. The pure joy and peace that comes from spreading the gospel is something that has strengthened me and helped me become truly converted to the gospel. I am grateful for this gospel. I am grateful for the knowledge I have and the chance to share this knowledge! It is a message that every single person needs and I am glad to be one that is worthy enough to bring it to others. I love this work, it truly is God's work. I love the people here I have to help, and I am grateful for the things they teach me every day. I love you all and am so grateful for your thoughts and prayers!